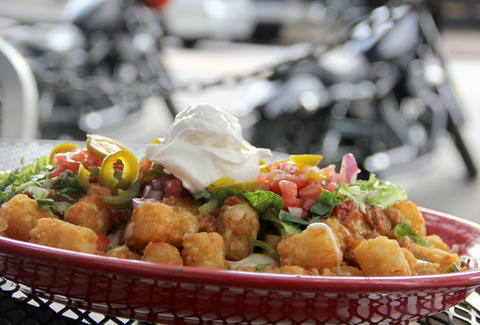 Here, they've introduced truffle-garlic tater tots, and what's more (for now) is they're running a special where if you buy any two specialty drinks, you get a bucket for free. 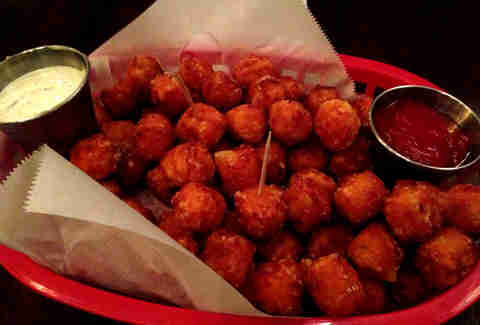 Side note: how are tot buckets not a thing everywhere? 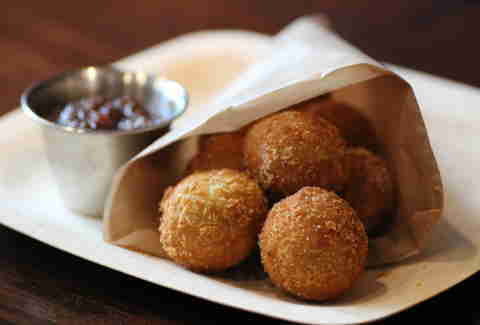 Maybe our favorite place to grab wine/beer in a jug, it's also behind these Parmesan and rosemary "Mashed Potater Tots" that come with the choice of bacon jam or cranberry jam... though, really, you should just get both. The guys heading this bar empire sure love their tots, as evidenced by the huge selection of ways you can get 'em: Original, Garlic, Truffle, Sweet Potato, Bacon Bleu (w/ bacon and bleu cheese! 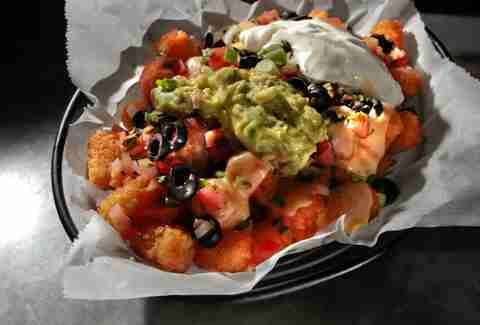 ), and even "Tot-chos", a tater-nacho combination with melted cheese, jalapeños, black olives, pico de gallo, sour cream, and guac. 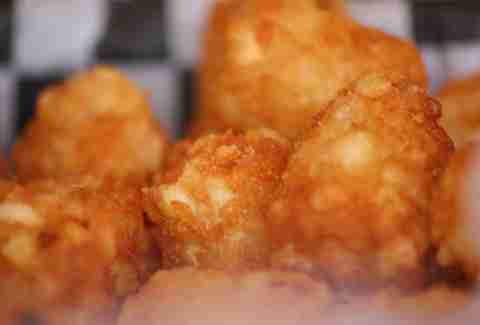 Obviously the carnival-themed restaurant that does that donut breakfast sandwich is doing something awesome, and that something-awesome is Sweet Potato Tots that come with blackberry BBQ sauce. 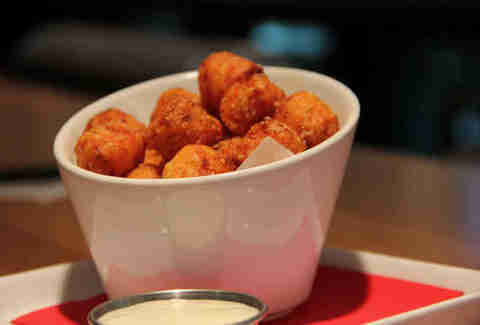 RB's basket of crispy sweet potato tots're served with ketchup and house-made ranch, dude. 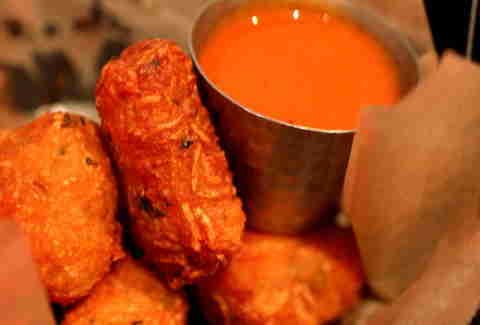 This Tenderloin spot (with the awesome upstairs that's never open) serves its fried taters with spicy ketchup (!) and roasted garlic-kalamata olive aioli (!!). Because, awesome, these are rolled in sharp cheddar, provolone, and Parmesan, caramelized, topped with jalapeños, and served with house-made ketchup. 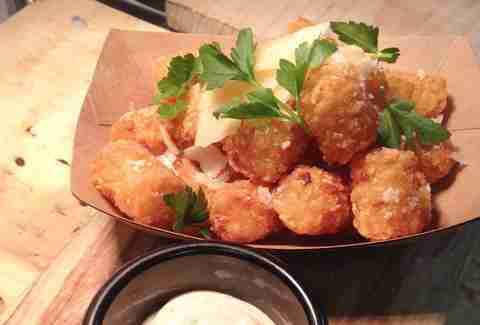 How could you turn down tots served with pork remoulade and bacon dust? Also: BACON DUST?!?!! ?